Toteg Tribe is the fruition of a long-cultivated series of groups, philosophies, organizations and ideas. Its roots reach back to the work of decades of practitioners of locally-based nature spirituality. Toteg Tribe's strength is in its mutability and viability over time. It remains today a vibrant and energetic spiritual system. It is my honor to speak as a representative of this living Tradition. "the lazy way people called the group we had in Sunland, California. It began life as an acronym for "Temple Of The Elder Gods" (T.O.T.E.G.). Temple of the Elder Gods (T.O.T.E.G.) was formally an ecclesiastical organization, incorporated as a California Non-Profit Religious Corporation with full Federal and State Tax Exemption on December 21st, 1984." Over time, the concept of "The Elder Gods" has evolved, but still remains a central focus of Toteg Tribe, one that will be discussed in the Beliefs and Practices portion of this essay. It is important to realize, though, that the meaning of the WORD Toteg as it is used in the name of Toteg Tribe is very different from the meaning of the former acronym TOTEG. "Unlike most neo-Pagan denominations, the tradition of Toteg Tribe does not consist of dogma about divinities, rituals, or ceremonies. Rather it is a movement of methodology, intent, and focus back to the experience of and interaction with the Gods themselves, including one's own personal Gods, if any, without artificial or affected cultural overlays." "We do not dictate who/how/what people's religious beliefs are; rather, we encourage folks from all walks of life to explore their 'Natural Spirituality.' "
It is sometimes the case that this "Natural Spirituality", as discovered by an individual, may have no component of worship of Gods, or even belief in Gods, only focusing on the individual's connection to Spirit. Toteg Tribe is about discovering effective ways of making this connection by direct personal experience of the practitioner. "I'd say that if the word "toteg" actually has a meaning today, that meaning is "grandparents." So, who we are may be defined as "people searching through their own experience for the ultimate meaning of their own existence, connected to the grandparents of all existence as family members." For purposes of this essay and definition of this spiritual tradition, the above is the "who" of Toteg Tribe. "Think in terms of location. A member of Toteg is like the citizen of a State. Membership in a Clan is like being the citizen of a City, and membership in clan branches is like being the citizen/resident of a neighborhood. None of these things preclude one from being a member of a religion, or club, or lodge, etc." But there definitely is a "Toteg mindset" that underlies all the approaches to whatever specific beliefs and practices a Tribe member pursues. That mindset, somewhat elusive, but unmistakable when it is present, is the core element of truly identifying oneself as a Toteg Tribe member, and it is of that mindset we will speak here. As was the case in my own experience, most people who are members of Toteg Tribe are people who are already pursuing a certain type of spiritual journey before they ever are aware of Toteg's existence. They are explorers of spirit, traveling diverse roads that will all ultimately lead to the same destination. They are non-dogmatic, and consequently open to the impact of their own personal experience without measuring it against any particular set of dogmas. The idea that links them to other practitioners of a similar spirit-walk is partly the idea that one's personal experience is the only valid arbiter of spiritual truth. "when people set aside preconceived notions and pet prejudices, and follow the instructions for having experiences, the content of these experiences they will have is strongly influenced by location, as well as by group and individual backgrounds. There is a much more common thread there than folks recognize at a first glance." Toteg practice is meditative, shamanistic and exploratory. Much of the personal experience of the Toteg Tribe member comes from direct communication with Spirit. There are many ways of invoking this communication, some of which include dream work, shamanic journeys, or meditative sessions fueled by drumming or trance inductions. There are also those who have no familiarity with any of the techniques mentioned here, nor have any realization that what is happening is actually communication with Spirit. They may even still be practitioners of conventional religious systems, or of no religion at all. But they have a "hunch", a leading, a feeling that there is more. And they do ascribe to the idea, whether or not they have consciously acknowledged it, that there is the presence of Spirit in everything. 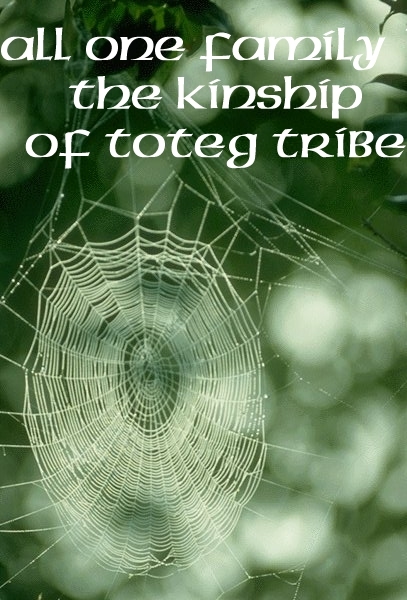 Indeed, one of the early experiences of many practitioners of Toteg Tribe spirituality is the realization that they do not completely fit in to other groups and organizations they may attempt to join, because their personal spirits are telling them to do, or to be, something or somewhere else. This individual instruction by Spirit is a constant in the experience of members of Toteg Tribe and is universally honored within the Tribe. Even where Totegers join with one another in Clans or other small group organizations within the Tribe, the method of conveying information to new members is different from what seems to be the norm in some other groups. Although the new member is likely at some point to be "given" or "revealed" the knowledge of a particular Clan Deity or set of beliefs, the new member is not the only one to be receiving knowledge when he or she enters the Tribe. Instead, it is also the Toteg Tribe way that all in the group will also incorporate the experiences of the new member into group journey-work, and so adjust the group mind to embrace the new elements. This keeps the group mind fluid, growing to embrace new experiences and other ways of understanding, and keeps the egregore from becoming stagnant and dying. Focus is on the land and spirit of the place where one resides. This focus does not preclude, but does precede, focus on the cultures or lands where their genetic forbears came from. If there is a "Toteg Deity" other than the Earth Mother, and the Sky Father, it is probably the "Genus Loci," which is at once the same God, and a different God, for every place on earth. It is this immanent and present Deity, the one that is the Spirit of the Place where one lives and works, that is the core of the Toteg Tribe member's focus on Deity. Other Deity forms, such as cultural archetypes of a particular person's heritage, may also be honored. But ways of connecting with these Deities, in Toteg Tribe terms, will still emanate from one's present and active connections with the Genus Loci. Methodology often proceeds from discovery to hypothesis, not from assumption to "proof". Many cogent insights for the personal practitioner of Toteg Tribe spirituality are not actively sought after, but are freely presented by Spirit without any prior expectation on the part of the practitioner. For this reason, one commonly heard mantra in my own Toteg Clan, Mountain Shadows, is "Pay Attention." We remain, in our ceremonies and outings and individual workings, open to the "AHA!!" of illumination or discovery. From these things, to which Spirit often draws our attention with no prior expectations on our part, may emanate observations on the nature of a particular reality, not the other way around. This often results in development of lines of thought or exploration not usually found in neo-Pagan methodologies, such as the melding of science and religion, or the practice of the shamanic arts. There is usually no limitation to the kinds of illumination that can comprise the totality of the Toteger's spiritual experience. If it happens to you, it's valid. Toteg Tribe honors the individual ancestry of its members, cultural, spiritual and hereditary. This does not, however, mean that the primary focus of Toteg Tribe is the veneration or respect for one's ancestors, whether biological, cultural, or spiritual. Nor does it mean that we necessarily do the same things in our spiritwalk as our ancestors did. We do, however, acknowledge our personal and individual roots, and we do the kinds of things our ancestors did in the kinds of ways they did them, to come up with our own answers. Recently Toteg tribe adopted the following Affirmation as a cogent outline of our principles and philosophies. I offer it here as a summation of the various answers to "What Is Toteg Tribe?" We honor and respect all of our ancestors: physical, cultural, and spiritual. We invoke the power of spirit for our own dreams and visions for the guidance of ourselves and our Tribe. Toteg Tribe is structured in a Clan system, because we have found that this structure gives the greatest degree of autonomy to individual groups. The Tribe is made up of a number of Clans and their associated subgroupings. No one is precluded, due to membership in Toteg Tribe, from membership and activity in any other coven, group, religion or organization. Each member of the Tribe has a voice in Tribal business and is equal in influence to every other member. The tribe is like a very large, multi-generational, far-flung family organization. The Patriarch of this family was from its inception Joseph Bearwalker Wilson, the founder and Tribal Doyen of Toteg Tribe. This is a position not of authority, but of responsibility. The work of the Tribal Doyen is mostly organizational, clerical and archival. The position is for life. When Joe died in 2004, the next Tribal Doyen was elected by the members of Toteg Tribe's leadership. Indeed, all such leadership positions are, like that of Tribal Doyen, largely functional in nature. It is not in the Toteg mindset to give high regard to the concept of hierarchy. Honor and respect is given in proportion to work and contribution, not accorded merely by means of title. Summation: Toteg Tribe has many similarities with groups of practitioners following other traditions. But there is one significant difference. Clans of Toteg Tribe may or may not be the primary spiritual focus of the members thereof. For this reason the different kinds of teaching, ministering and spiritual work required on the part of leaders within the Tribe may require a vastly different approach and a far more diverse skill-set than is assumed to be part of more traditional priest/essing. Certain members of Toteg Tribe may be called upon to do shamanic journeywork, spiritual or physical healing, psychic prophesy, and many other things not normally encountered in more "traditional Traditions." What is most important to us in Toteg Tribe as we define ourselves, is the close-knit, familial feel of the Tribe, and the deep respect and interest with which members regard one another and one another's journeys of spirit. The feeling of membership in Toteg Tribe differs from that of other groups, simply because we are not bound together by a doctrine, or ritual structure, or lineage, or tradition, or Book of Shadows, but by our free will and choice, and the permutations of sharing in that context are endlessly interesting. We hope readers of this essay who may feel that "hunch" or drawing of Spirit might be encouraged to investigate and see whether you might like to be part of our family. Copyright © 2004 by Aisling SongWeaver. All rights reserved. Copyright © 2004 Toteg Tribe.